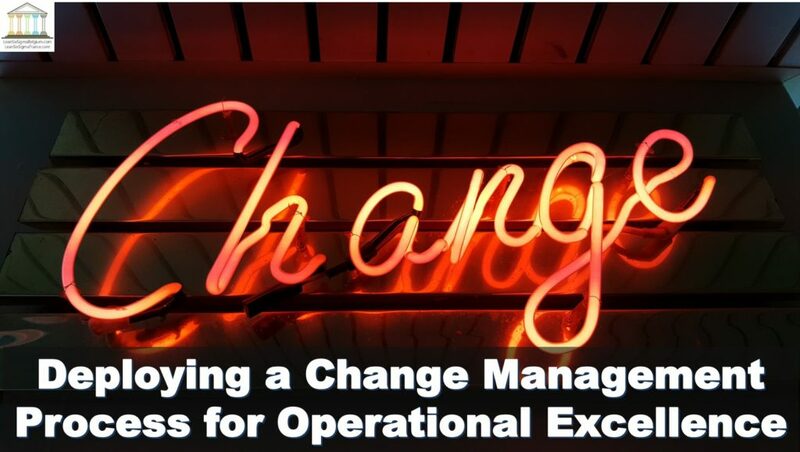 Talking about operational excellence and actually making it happen are two very different concepts. What appears to be great in theory, or even as a case history faces at least three significant challenges in deployment and maintenance once introduced locally. The first is relevance. What works for one company at one time might not apply to another company elsewhere. For example, if you are a Belgian-based high-tech company, your experiences will be vastly different than a Seattle-based coffee company. The second is project management. To lay out a roadmap for improved productivity, communication or other forms of operational excellence requires sound project planning, followed by careful adherence to the plan, even when situations change. In short, people grow used to their surroundings and form a type of contentment around them. Even if life is not perfect, at least it is knowable. A change agent who wishes to shift these people to a new situation, for example moving to a new office building, or using new technology in the workplace, would first need to break through this existing complacency. To do so with the fact of the change, such as “we are moving to a new office in Brussels next month” or “we are all going to use mobile apps to file our reports from now on” is too much, too soon. People will naturally rebel, and the project will fail. The goal of this first phase is to simply “break the ice,” by sharing a vision of how much better life might be if we were to move to a newer, brighter space, or if we were to find a way of cutting down on paperwork. Once an idea (vision) has been planted in people’s heads, the desire to push back against change will still be strong. This is driven by fear, which is the most powerful of all our emotions. Humans respond to emotions first and use logic as a secondary source of understanding. This inequity means we must inject sufficient facts (logic) to neutralize the instinct of fear. This is where the data comes in. Descriptions of the new office space or app mock-up or flows are now appropriate in this second phase. These facts would have been useless or even damaging if delivered during the contentment phase but are now needed to counteract powerful emotional responses in a manner similar to the way Aspirin takes on physical pain. In the third stage, people generally move into a place of confusion as their instinctive fear and rejection of change battles it out with the clear facts that are being presented. This is a period that demands solid, capable leadership accompanied by a clear, tangible plan. Another trait of humans is their desire to be led and guided through periods of uncertainty. A strong leader will be able to give people the comfort needed to move them through to the final stage. Renewal is the point in which people have embraced change, either willingly or tentatively, and are now ready to move ahead with it. This presents an opportunity for change agents to leverage their newfound enthusiasm or cooperation to push the change through to the finish line. I find Janssen’s four rooms technique to be more efficient and humanistic than the giants of the change management self-help industry such as John Kotter and Spencer Johnson who wrote Our Iceberg is Melting and Who Moved my Cheese respectively. Although both books present the complex world of change management in a user-friendly fashion, using penguins and mice as the characters that bring the concepts to life, Jannsen speaks directly to the human condition rather than the characteristics of the change process. Excellence will remain an elusive goal by its very nature. Even if a company could deliver a product or service with zero-percent defect rate (a grail of the Six Sigma concept that I describe here), the process of development, delivery and support would continue to evolve, as that is the nature of business. Change management is part art and part science. But it must never be left out of the process, so long as we Humans are involved.